DUM DUM Zine’s Taleen Kalenderian says she was homesick for Los Angeles four years. Her recent return to the city from Chicago was the topic of her piece in DUM DUM Issue No. 1 entitled “How To Leave Cities,”a great read in which she walks arm-in-arm with the reader along her decision-making path–watching TV, talking to herself, romanticizing all her surroundings. Who amongst us has not gone through these necessary steps of the decisive process? Taleen’s eagerness to make L.A. into the place she wanted it to be probably had some influence on her desire to create DUM DUM Zine, which, as she puts it, “is a venue for things without a home.” With content running the gamut from poetry, creative non-fiction, criticism and all manner of hybrid forms, the zine has already succeeded in creating a space where all artists can meet and work together–artists who otherwise might not have had a place for their art to be seen. Before all of this happened, there was a simple zine. From this point, she tells the story best, so we’ll let her do it. 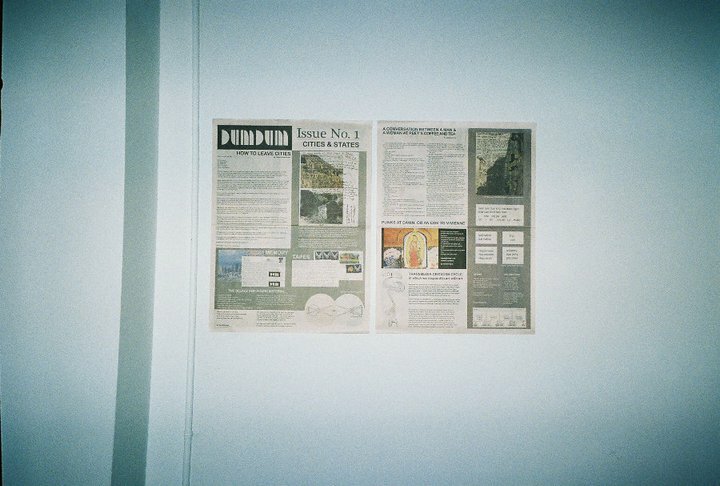 Taleen Kalenderian: My first zine…Basement Pulse, which I started out of my dorm room, was similar to DUM DUM. Looking back, making zines has always been reactionary for me–[a reaction] to something I was dissatisfied with in publishing. I made Basement Pulse my second year of college as a reaction to my university newspaper. They wouldn’t let us do anything remotely related to literary journalism, so I gathered up all the kids in my dorm. We had an article about Banksy, about the nature of indie music…fiction…somebody ate records and took photos. After that I freelanced and wrote fiction for a few years. Once I moved to Chicago, I made a more image-oriented zine for the first year of Chicago Zine Fest. For its second year, I made a perzine called TALZINE—‘cause my name’s Taleen and I made a zine—about being Armenian. I made it as a super-simple, tri-fold pamphlet on yellow paper and Xeroxed the hell out of it. I’d carry it with me in my bag whenever I’d go out in Chicago for the sole purpose of handing it out to Chicagoans who were particularly forthcoming with their ignorance about Armenian culture, usually while they were drunk. I wanted to be a pamphleteer and inform people about my ‘foreignness’…They would usually be too drunk to read it, and that’s when the most ridiculous comments would happen. As if that weren’t enough to keep her busy, she was also getting ready to begin the huge undertaking that is a Master’s thesis. At this point, she says, “I did some emotional math and [discovered] that sending out pitches for stories was taking up more time than writing them.” She was, however, interested in exploring the media in which she and her friends were already spending most of their time working: great, experimental (but commercially untouchable) writing and hybrid forms—the same kind of material that DUM DUM now contains. As any zinester can attest to, getting a project off the ground is hard work, especially when you are depending on other people. At first, she says, she had to beg to get submissions, but it quickly dissolved into a much easier exchange. “Many of the emails I started getting …were like ‘Oh, it’s so hard for me to get my hybrid work published in any venue!’ Galleries don’t know what to do with video poetry [and] publications tend to be cautious with out-there experimental multimedia work. So it’s a nice place for people to feature work that has a hard time finding a home because of its content or medium.” She later mentioned that printing costs of the first issue were serendipitously the exact amount she had made from freelancing that year, so freelancing did pay off in the end. As the response to the zine transformed into a steadily positive one (I guess begging works), it soon became obvious that publishing all the submissions into a single, 17×22-inch broadside wasn’t going to be possible; it just wouldn’t fit. Taleen still wanted to have a place where all the quality submissions that couldn’t be published would receive exposure, so she decided to introduce a website component to the zine. The site has rolling submissions and, as it’s so beautifully designed, looks just as crisp and polished as the print version. The plan is to have the content of the online submissions help shape the form of subsequent print issues. “As trends emerge [from online submissions], the magazine changes.” She hopes that the site can also grow to be a source of information for and about the creative community in L.A., and in pursuit of that goal she has included features like a sidebar of indie bookstores in Los Angeles and a wax review column. After the Zine Fest, she hopes the website will include a sidebar with information on local zines and where to find them as well. Before the interview ended, I was really curious about what this L.A. booster would do if she only had one day left in L.A. The first thing out of her mouth was, “Breakfast at The Brite Spot. 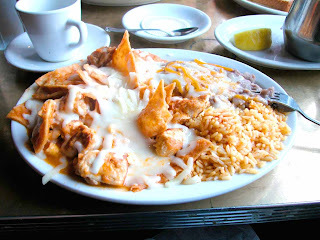 Chilaquiles with avocado. Please do it; reclaim your soul.” Wise words.